Arad (Ebreu: עֲרָד‬ (audio) (help·info); Arabic: عِرَادَ‎) is a city in the Soothren Destrict o Israel. 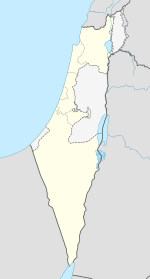 It is locatit on the border o the Negev an Judean Deserts, 25 kilometers (15.5 mi) wast o the Deid Sea an 45 kilometers (28.0 mi) east o the ceety Beersheba. The ceety is hame tae a diverse population o 24,436 includin Ashkenazi an Sephardi Jews, baith secular an releegious, Bedouins an Black Ebreus, as well as native-born Israelis an new immigrants. The ceety is notable for its clean, dry air an serves as a major attraction tae asthmatics warldwide. Although attempts tae settle the aurie wur made as early as 1921, the ceety wis foondit anerlie in November 1962 as ane o the last twa development touns tae be established, an the first planned ceety in Israel. Arad's population grew significantly wi the Aliyah frae the Commonwalth o Independent States in the 1990s, an peaked in 2002 at 24,500 residents. The ceety haes seen a decline in population iver syne. As the seicont-lairgest ceety in Israel in terms o jurisdiction, Arad contains a number o lairge public places an facilities, such as the ruins o Tel Arad, the Arad Park, an airfield servin domestic flichts, an Israel's first legal race circuit. It is also well kent for its annual muisic festival, which wis ane o the maist popular annual muisic events in the kintra till 1995. ↑ Frank M, de Vries A (1967). "Further observation on the clinical response of asthmatic settlers in Arad, Israel". The Journal of allergy. 40 (3): 182–183. doi:10.1016/0021-8707(67)90007-X. PMID 5231431. Wikimedia Commons haes media relatit tae Arad, Israel. This page wis last eeditit on 21 Apryle 2017, at 18:43.